Every practitioner wants more freedom, joy and profits in their practice. Yet building a rewarding and profitable holistic, functional or integrative practice can be a challenge given the constraints of the mainstream medical system. That’s why I’m thrilled to introduce you to The Prosperous Practitioner Summit [YOUR LINK], a free online business-building event March 1-8 exclusively for holistic and integrative practitioners. Truth is, my heart beats faster when I think about the opportunity before us to help people get truly WELL and lead healthier lives. But it’s going to take a frustratingly long time if alternative health practitioners play small or struggle to build a thriving business. That’s why you want to be at The Prosperous Practitioner Summit. It’s about practitioners helping practitioners find success by sharing their best strategies for earning more revenue, getting better clinical outcomes, and reconnecting with the joy in their work. 20 practitioners and experts have agreed to generously share their hard-earned knowledge to support you in achieving lasting impact, deep satisfaction and true prosperity. We’ve got a big mission. Let’s get to work! Full disclosure: The summit is 100% free and there is no obligation to buy anything ever. However, if you choose to purchase a summit package I may receive a commission. I fully believe in the value of this information and would never endorse anything I did not believe in. It’s not always easy building a successful holistic, functional or integrative health practice. The mainstream medical establishment doesn’t always value your work and payment structures don’t support you in spending the kind of time you know your patients and clients need. Yet there’s a tremendous opportunity for holistic and integrative practitioners today as consumers demand alternatives to the short sighted “band-aid” fixes of conventional medicine. 20 practitioners and experts are going to give you a rare behind-the-scenes look at what it takes to create an extraordinary practice as a holistic, functional or integrative practitioner. These are no-holds-barred, honest conversations about the steps (and missteps!) they’ve taken on their paths to achieve financial abundance, personal satisfaction and freedom. And, just as important, how they partner with their clients and patients to produce life-changing results. 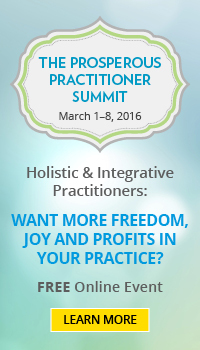 Want More Freedom, Joy and Profits in Your Practice? That’s why we’re thrilled to introduce you to The Prosperous Practitioner Summit, a free online business-building event March 1-8 exclusively for holistic and integrative practitioners. Use any of these banners on your site. To download any of these banners to your computer, right click and choose "Save Image As".